Yep, we moved! We're still in the Raleigh area, but just moved from one suburb (Cary) to another (Holly Springs). We were outgrowing our house at a rapid rate and it was time for a move. As many of you probably know, moving a family of 5 is no small feat. It's been exhausing, both physically and emotionally. I'd like to think the worst is behind us, even if we still have a LOT of unpacking and settling in to do. I haven't unpacked a single sewing or fabric box yet! ... enjoying the summer! 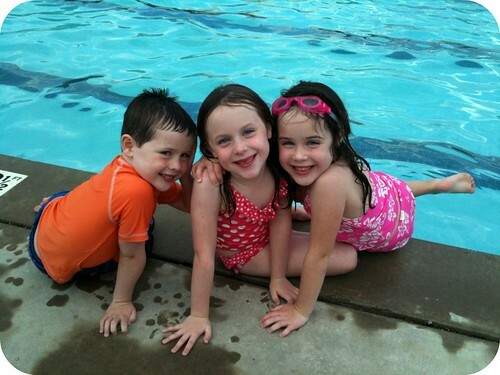 Here's a picture of the kids at the pool this past weekend. We finally saw a drop in temperature from the high 90's (just in time for my move, of course) to a much more reasonable mid-80's, which was perfect for some summer fun. I do have a bunch of draft posts just waiting to be written and pushed live, so I'll be trying to get those out over the next few days. Thanks so much for sticking with me! welcome back! enjoy your summer ... don't you worry, we'll still be here once you've done all your settling in and unpacking! Congrats on the new house! Moving is such a pain, but it sure is worth it in the end. Unpack, enjoy your brother's wedding, have a little fun with the kiddos this summer...we're not going anywhere! Still here! Congrats on the move and your new house is beautiful!!! Ugh. Moving is such a stressor. Have fun at the wedding! Here's some inspiration for ya! Those two photos are awesome reasons to be MIA! Enjoy your summer, your home and your family! Wow! Your house is lovely! Have fun unpacking ... that is the worst part about moving! Well, and painting! Welcome back ... you were teaching me patience, right? I do not envy you the move, but your house is sure gorgeous! Hope you're back to sewing soon, but don't worry -- no one's leaving while waiting for you. Welcome back!! Congrats on the new house! Move is a four letter word. Bleh. Take your time. You can't get rid of us that easily! The summer has been like that for all of us. I thought you were moving to Chapel Hill. Happy Summer! Wow, your new house looks amazing! Your kids are adorable. Have fun at the wedding! Oh my gosh! That house is gorgeous! Your new house is beautiful. Congrats. We are getting ready for a hot spell and I get to help my son and his family move. Yeah!--not. You couldn't get rid of us if you tried! I did miss you though. Congrats on the move. We'll wait patiently for the unpacking and new posts! So, get to work on that speech. See you back here soon (I hope). The new home looks lovely! The new house is gorgeous! I'm glad that you've gotten to enjoy a bit of summer. What a fun and busy summer for you! Enjoy! That makes me kind of sad that we won't see your deck anymore. where are you going to hang your quilts for pictures now. You must be exhausted. I just helped my sister and her 3 kids (all under 5) move house. Brother-in-law wanted to save money and do it all ourselves so I feel your pain. My arms are aching just thinking about it. Looking forward to hearing from you again and Happy New Home! Beautiful new home, John! All my best to you and your family. Looking forward to seeing you in a few weeks! Congrats to your brother. Congratulations on your new home! I'm sure you'll make yourself a wonderful sewing room!! !Enjoy your summer fun and trip to NY!! Are you serious? Or just kidding? Wow, that is an amazing house! Hope it will be a good home for you and your family for a long and happy time. 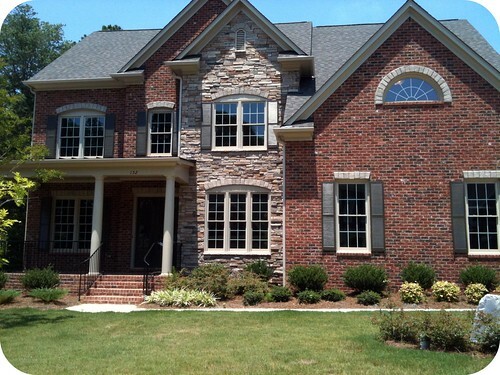 Congratulations on your new home- it looks like its a gorgeous place for you and yours. You will be soon sewing up a storm again. Glad to hear from you again. I thoroughly enjoy your blog, and will keep checking it. Have fun getting organized! Hope you have a great time in Brooklyn (the top of the food chain!). Congrats on the new house as well. What! You're in HS now! That's awesome! You're going to love it here, it's a great little town. Congratulations on your move! We have our house for sale to hopefully move back South as well. Your new house is so pretty! Oh my, we are hyperventilating at your house, that is the coolest! American houses are amazing... jealous much!! Hey don't worry about posting, we will still be here when you get back! Just be aware its as hot up here in Brooklyn (where my daughter lives, I'm in hot Poughkeepsie) as it is down the NC! I hope you have many happy years in your new home. welcome back! delight in your sunny season ... don't you fear, we'll still be here once you've done all your settling in and unpacking! I am so happy to see this website once again for blitz brigade hack no download such a fantastic creation has been delivered for you as website than click here and enjoy again with this website. Very nice and interesting post! So beautiful pictures! Essay writing service will help you to save your free time and get the best result! So don't hesitate and follow us! Hello! I like youy post! We live in that time when technologies are really advanced. You should not spend all your time on studying anymore. In some cases you can take an occasion to ask for a help from qualified writers. Congrats on the new house! moving is a bad thing, I know it) And never forget about your readers! I want to tell you, that you, that your blog is very interesting and your writing skills are excellent. And And do you ever think about offering essay writing help ? Amazing house! You are lucky! I have always dream about pool near the house and to leave with a comfort. By the way, if you need some help writing paper or something, just click here for essay writing service. Wow, what a beautiful house. Kids are os happy ;) P.S. if oyu want to spend more time with friends, get essay help at www.custom-essays-online.com.